I woke on Friday morning still abuzz from the gig the previous night. Somehow I managed to get a deep nights sleep in my Hammersmith hostel, amazing given my adrenaline levels and being in a noisy hostel. The main plan for the day was not to head back straight to Warwick though. One of my new work colleagues had a meeting in London, so Jane, my main research partner here, decided to come down to London and join us, so that we could have a more casual day getting to know each other and talk research. So at midday I was to meet up with Jane and Sara. But in the meantime the morning was mine. So thanks to Mitch, I headed out exploring. First up from Hammersmith was to visit Portobello Road. No Mary Poppins, but the markets were being set up and I saw my first Banksy in a few years, and one of the classics “Graffiti Painter”. 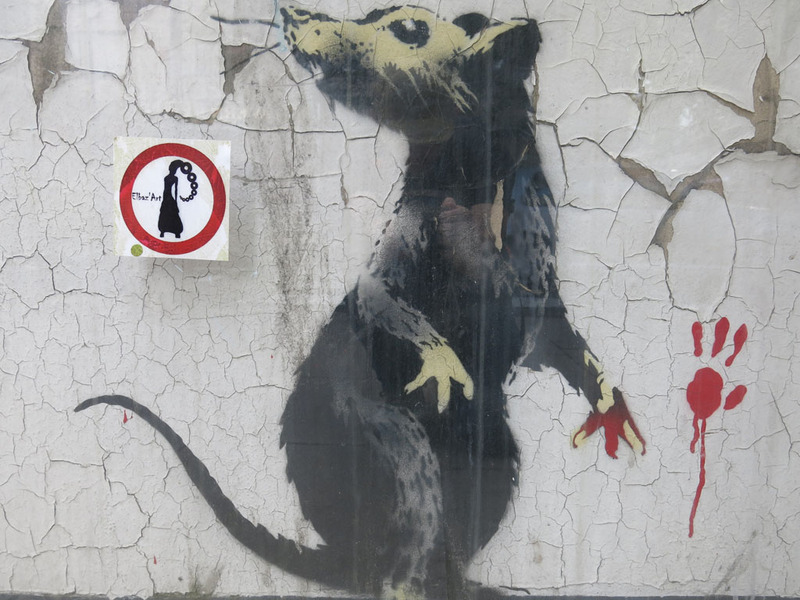 This one is quintessential Banksy… so funny yet so well created. Unfortunately this is hard to get a great snap of as it is just behind market stalls, and I guess everyone takes it for granted these days as things just get left in front of the work, hiding it from public display. But I was able to manage some pics. 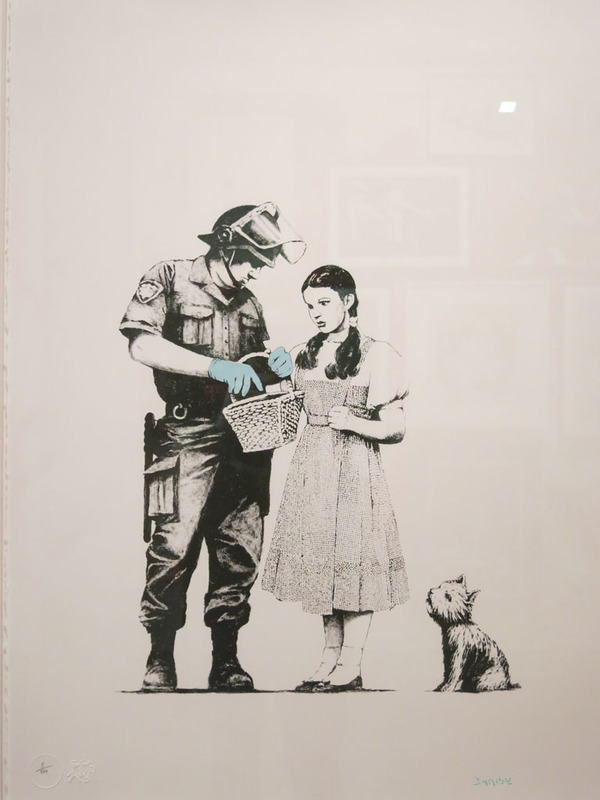 The detail for covert spray painting and stencil work is always under appreciated in Banksy’s work, and in this one, the artist is some of his best work. 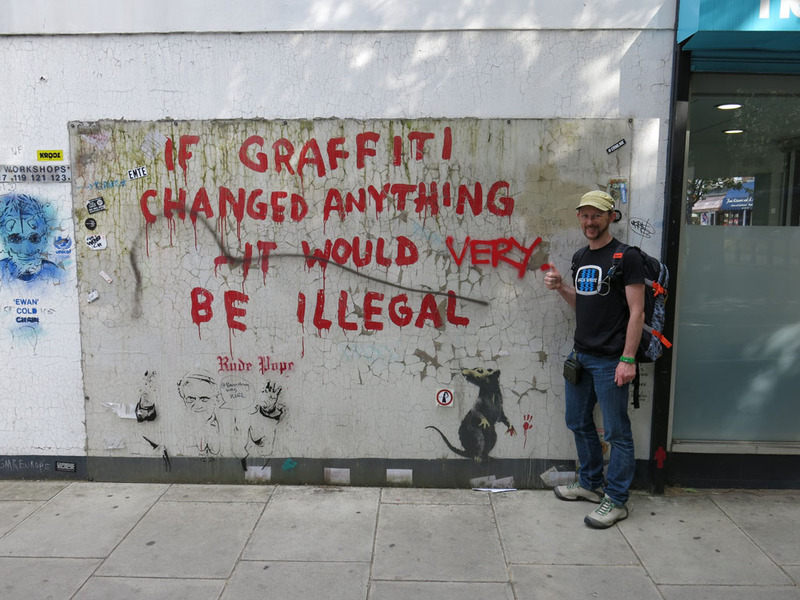 So off it was to chase more Banksy! Next stop was Great Portland Street to see another classic. Not as classic for the stencil work, but for the appearance of a trademark rat and witty slogan. Again, this was just there for all the locals to casually wander by, except for people like myself to visit. A French trio were also looking out for some Banksy work and we crossed paths here, enabling a cool snap. This is also a great one to see as it contains the classic elements and is well preserved and is easy to get some snaps of. 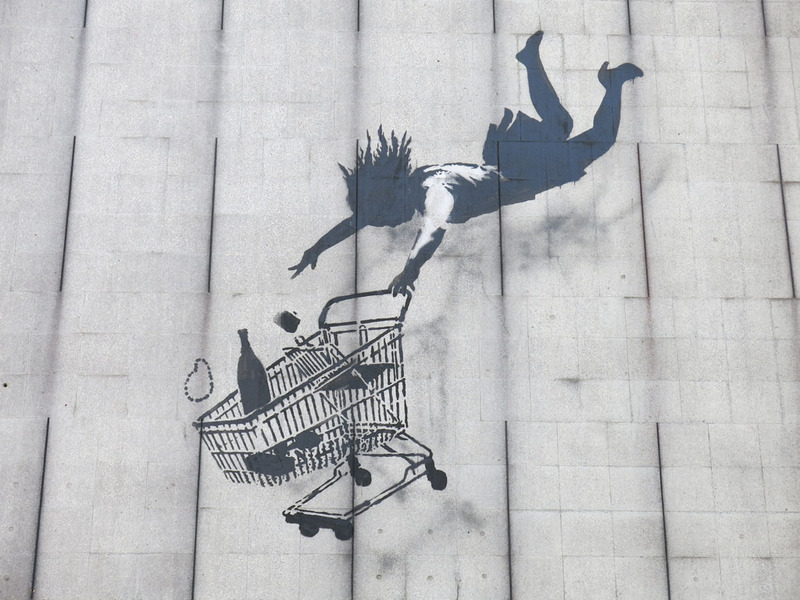 Easy to get to as well, so pop it on your list of Banksy targets! Coffee in hand, it was off to number 3. Rather than tube it, I legged it down to Regent St to check out a Banksy in a slightly less obvious location. Although much closer to busy thoroughfares, it is hard to spy as the “Falling Shopper” is not at eye level, rather up high, adding to the drama of the piece (as well as a “how the heck did he do it?!”). Although not as classic as the others, this is still a great one to see and super easy if you are shopping along Regent St.
As luck would have it there was even a Banksy exhibition happening in London, and just near the Falling Shopper. Believe it or not, it was being held at… Sothebys. Yep. 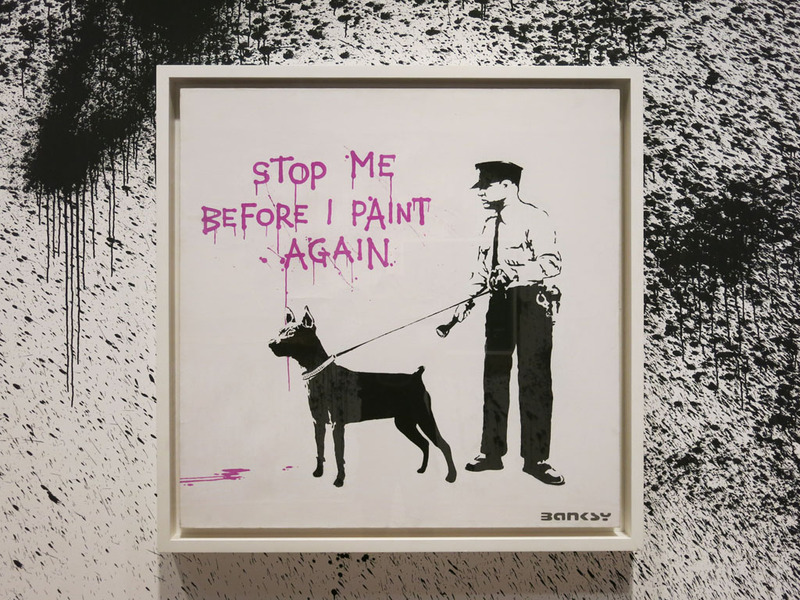 I guess not unexpected, given Banksy pieces, both prints and street works, command such huge prices, of course Sothebys would house it. 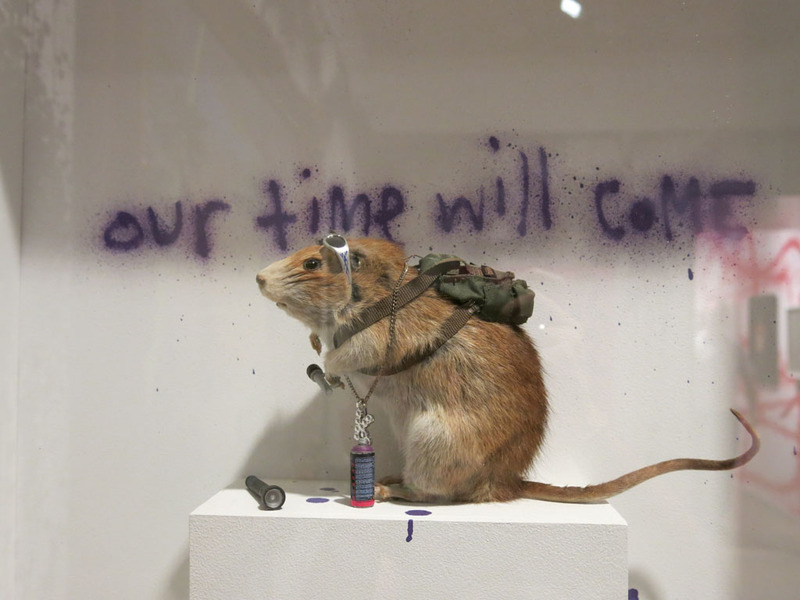 This was an exhibition collected of works from Steve Lazarides, Banksy’s former agent. Over time, he has obviously amassed a huge Banksy collection of prints, one off canvases, and gallery pieces, and they were all on show. No auction, but apparently all up for sale. I decided not to waste their time and find out how much some of my favourites were. Below are a bunch of pics of some of my favourites, which was kind of odd to see all in a gallery setting. Regardless, still a thrill to see them. 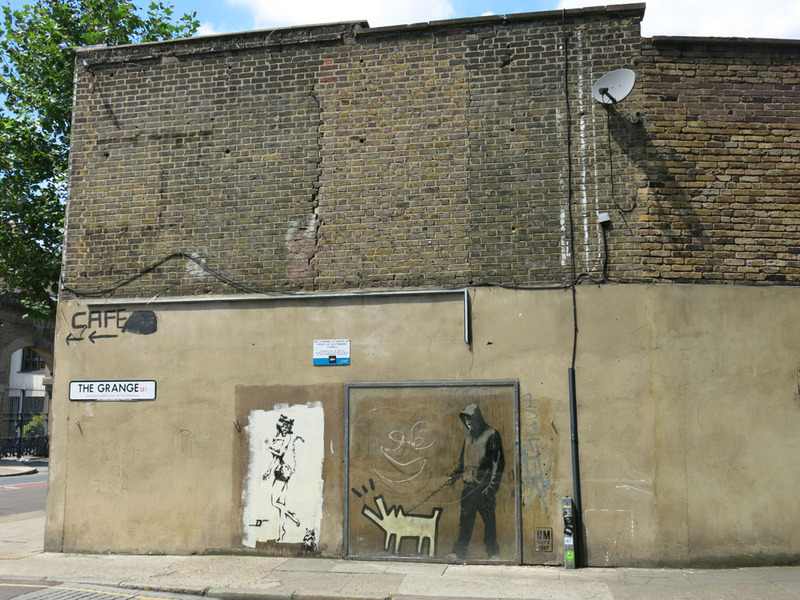 I hadn’t gotten my fill of Mr Banksy quite yet, and it was time to visit just one more. I legged it down to the nearby tube station, swinging by the National Gallery building. This is what I love about London. If I wanted to pop in and see a Botticelli, I could. Not today, but I would be back in to see one of my favourite paintings before I leave England no doubt. 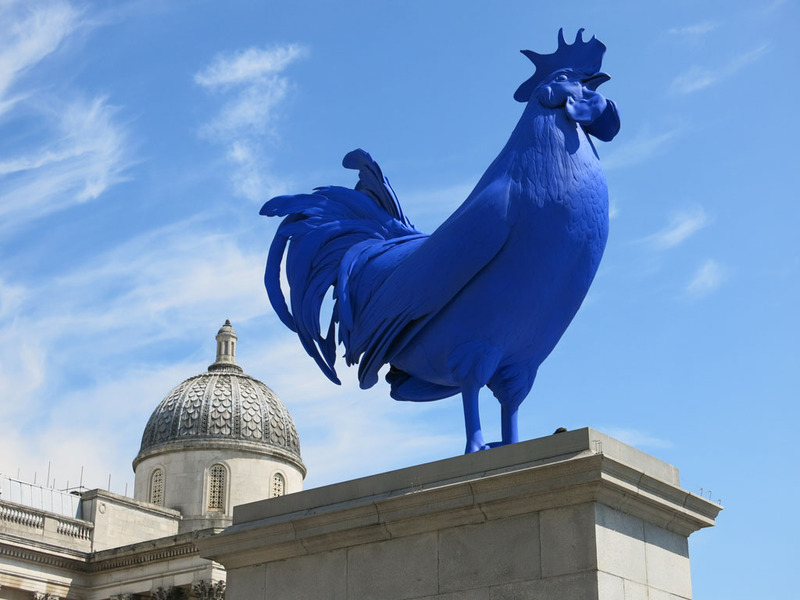 a big blue rooster. of course. I did like the big blue rooster though out the front. Now THIS is art. “Choose Your Weapon” is a great work, well preserved in an area down from Tower Bridge. I was super excited to see this one because it adorns my study wall. Like Graffiti Painter, some of the stencil work on this is incredible, again hard to imagine that he would have had hours to do this without being caught. The juxtaposition of Banksy’s stencil work and the Keith Haring dog is great, a fantastic comment on the hoodie/pitbull culture of some parts of the UK. While checking this out and snapping photos, an older guy decided to say hi and have a chat, asking me if I had travelled to see the piece and what I thought. I said I thought whoever owned the wall was a rich man. He played dumb for a little bit and then explained that it was his wall and that he owned the row of shops it was painted on. He explained how he had to put in the camera to stop the vandalism, but that it was regularly visited by all kind of people, including even the local school groups. He seemed like a nice chap and told him I was thankful of people like him that decide not to tear down the wall to sell. So I said goodbye to my last Banksy and made my way to catch up with Jane and Sara, down on Southbank. We spent the afternoon talking research and wandering Southbank, and finding time to pop into the Matisse paper-cut exhibition at the Tate Modern which was quite cool. After some dinner, it was back on a train to head back toward Banbury with Jane, to spend the weekend with her and her family before moving into my own flat next week. But what a way to spend a casual day in London. Love it, I feel like I was there 🙂 I wish there were more to see in the wild, there used to be a couple in Boston (my town), but they are gone now.